Single site located between junctions with access to both sides. Formerly and romantically known as Gretna Green, this is the first services you'll pass as you head in to Scotland on the A74(M). First two hours free for all vehicles, after which cars must pay £15 for a further 24 hours and HGVs, caravans and coaches must pay £26 (or £28 to include a £10 meal voucher). One of the two entrances, with blue doors, Starbucks on the left, and Burger King on the right. The services have un-gated access to the B7076. This and the road layout in the area means that the services are often treated as an unofficial junction. During April 2017, the filling station was sold by BP Express to MRH. It is now operated by MFG. Originally Gretna was a pair of petrol stations staggered on the A74. There was a flyover between them, which provided access to each side of the road and the road to Springfield. Forte built a large amenity building here on the northbound side, with a Little ChefHistory, The Granary restaurant, and the country's first Little Chef Lodge. The hotel was rebuilt in 1985, and then became a Travelodge in 1989. In 1992 this section of the A74 was replaced by a motorway. Strictly speaking only the southbound filling station was affected by this, and a new junction provided access to the old facilities. However, the old facilities were outdated, too small, and not in an ideal position. As a result, Forte knocked down the old facilities and built a new forecourt, motel and amenity building on a larger section of land, roughly occupying the same area. New signs were erected pointing to the "Accom. and services", and others called it 'Gretna', even though publicity continued to call it by its full name for some time. The main amenity building has units built in a courtyard around a Burger King (previously Julie's Pantry) in the centre, with two glass roofs following the main walking paths around the building. This creates a site much larger and more airy than nearby Abington. 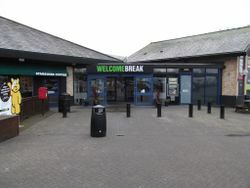 At the time, Welcome Break wanted their services to each have a unique shop. At Gretna, this was the Canny Scot Shop, and it is the only one still to be open. Some of the space now used by the Harry Ramsden's outlet had previously been used by an extended WHSmith store. 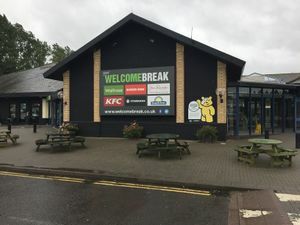 Although the front of the services has been refurbished many times, the interior doors are still in their original blue-and-yellow colour scheme. The services have lengthy access roads, designed to provide relaxation by looking like an upper market property. The car park was equipped with mock-historic lamp posts, with a round bowl at the top of a short post, like you might find in a hotel or restaurant of the same era. Unusually, these extend all the way along the sliproad to the motorway. Posts like these normally light up a car park or pedestrian walkway, but at Gretna they're used to light a road with a 70mph speed limit. The original facilities are roughly in the position of the car park at today's services.